NASA aims to create the coldest place in the Universe on the International Space Station (ISS). They will send a box the size of a refrigerator called Cold Atom Laboratory (CAL) to the orbital platform in this summer of August. 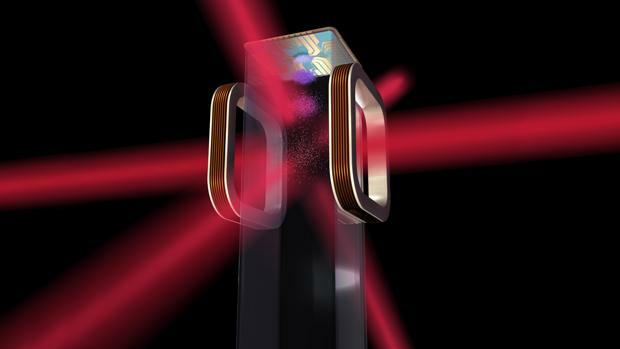 The instrument will use a laser to freeze gas atoms at one billionth of a degree above absolute zero, more than 100 million times colder than the depths of space. These experiments, which will include Nobel laureate Eric Cornell, one of the “inventor” of Bose-Einstein condensates (a rare state of matter), will help develop technologies such as sensors, quantum computers and atomic clocks, and can shed Light on the mysterious and elusive dark energy. The Cold Atom Laboratory (CAL) was developed by NASA’s Jet Propulsion Laboratory (JPL) in Pasadena, California. Within that box, a laser, a vacuum chamber and an electromagnetic “knife” will be used to nullify the energy of the gas particles, slowing them down until they are almost steady. Atoms will cool to extreme temperatures within the CAL. Then they can form a different state of matter known as Bose-Einstein condensate. In this state, the known rules of physics recede and quantum physics begins to prevail. Matter begins to behave in another way, less as particles and more like waves. The rows of atoms will move in concert with each other as if they were riding a moving fabric. These mysterious wave forms have never been seen at temperatures as low as those that will achieve CAL. When atoms are cooled to extreme temperatures, as they will be in CAL, they can form a different state of matter known as Bose-Einstein condensate. In this state, the familiar rules of physics recede and quantum physics begins to take over. Matter can be observed behaving less like particles and more like waves. Rows of atoms move in concert with each other as if they were riding a moving tissue. These mysterious wave forms have never been seen in temperatures as low as what CAL will achieve. The plan create the coldest place in the Universe is to fill the Cold Atom Lab with gas particles aboard the International Space Station where the unique micro-gravity environment will allow researchers to observe quantum phenomena never seen before that are impossible to detect on Earth. Which means that they are usually only observable for fractions of a second. Bose-Einstein condensates are of particular interest to physicists because in this state the rules of classical physics change – like Einstein’s theory of general relativity – to quantum physics, and matter begins to behave less like particles and more Like waves. Understanding this transition is the key to one of the greatest open questions in modern physics, when used separately, the theory of general relativity and the quantum field can explain the larger and smaller things of the Universe respectively. But no physicist has managed to make them uniform. A coveted “theory of everything”. For that reason, physicists would love to look at the Bose-Einstein condensate for days, but because the gravitational pull of the Earth puts a quick end to the free-fall state necessary to maintain this exotic matter, it is usually only observable by some few fractions of a second. But on the International Space Station, ultra-cold atoms can keep their wavy forms longer while in freefall. Not much, NASA predicts create the coldest place in the Universe will be able to keep the Bose-Einstein condensate in the Cold Atom Lab for up to 5 to 10 Seconds in space. That gives scientists a longer window to understand physics at its most basic level. Thompson estimated that CAL will allow Bose-Einstein condensates to be observable for up to five to 10 seconds; the future development of the technologies used in CAL could allow them to last hundreds of seconds. Five scientific teams plan to conduct experiments using CAL. Among them is Eric Cornell, of the University of Colorado, Boulder and the National Institute of Standards and Technology. Cornell is one of the Nobel Prize winners who first created Bose-Einstein condensates in a laboratory environment in 1995. The results of these experiments could potentially lead to a number of improved technologies, including sensors, quantum computers and atomic clocks used in space navigation. And not only that. The experiment can also help in the difficult race to detect dark energy. Current models of cosmology divide the Universe into about 27% of dark matter, 68% of dark energy and 5% of ordinary matter. “This means that even with all our current technologies, we are still blind to 95% of the Universe,” explains Kamal Oudrhiri of JPL. “Like a new lens in Galileo’s first telescope, the ultra-sensitive cold atoms in the Lab Cold Atom have the potential to unlock many mysteries beyond the boundaries of known physics,” he says. Already in the final stages of assembly, this really cool “refrigerator” will fly to the ISS in August aboard a spacecraft of privately owned SpaceX CRS-12 freighter to create the coldest place in the Universe.